Your morning list of things worth knowing. Item the First: climate sensitivity may be lower than we'd thought; this bends optimal policy towards adaptation and away from abatement. I still think it best to have a low budget-neutral carbon tax set to ramp up on a well-announced schedule, but with flexibility to twist the schedule up or down as we learn more about climate sensitivity. If such estimates were right, they would require revisions to the science of climate change and, possibly, to public policies. If, as conventional wisdom has it, global temperatures could rise by 3°C or more in response to a doubling of emissions, then the correct response would be the one to which most of the world pays lip service: rein in the warming and the greenhouse gases causing it. This is called “mitigation”, in the jargon. Moreover, if there were an outside possibility of something catastrophic, such as a 6°C rise, that could justify drastic interventions. This would be similar to taking out disaster insurance. It may seem an unnecessary expense when you are forking out for the premiums, but when you need it, you really need it. Many economists, including William Nordhaus of Yale University, have made this case. If, however, temperatures are likely to rise by only 2°C in response to a doubling of carbon emissions (and if the likelihood of a 6°C increase is trivial), the calculation might change. Perhaps the world should seek to adjust to (rather than stop) the greenhouse-gas splurge. There is no point buying earthquake insurance if you do not live in an earthquake zone. In this case more adaptation rather than more mitigation might be the right policy at the margin. But that would be good advice only if these new estimates really were more reliable than the old ones. And different results come from different models. Item the Second: All that stuff about food deserts? Probably not worth worrying about. And fast food outlet concentration likely doesn't matter either. The researchers, who reported their findings in last week's journal Preventing Chronic Disease, looked at the habits of 97,678 adults in the California Healthy Interview Survey, and their weight, body mass index, and other indicators such as income. They overlayed a map to determine the number of fast-food places, full-service restaurants and various kinds of food stores within five ranges, from half a mile to three miles from home. “The evidence is not clear on whether promoting or discouraging a particular type of food outlet is an effective approach to promoting healthful dietary behavior and weight status,” the researchers said. Los Angeles has tried legislating the types of food outlets in South L.A. to help bring down obesity rates. Caveat: I've not had a chance to read the underlying paper. And there are all kinds of endogeneity problems in this general line of research: it's hard to find an instrument for fast-food outlets' opening, and you need one to sort out the endogeneity problem if there is any correlation: do fast-food outlets cause obesity, or do fast-food outlets open in places where a lot of obese people live? But, the LA Times reports they found only weak association between location and outcomes; they put it down to that most people are able to drive to get what they want. Item the Fourth: Bicycle helmet laws still cost lives on net. Here's a website run by cycle campaigners pointing to the literature on it. Here's a town in Washington State that dropped its helmet law because Council worried about an interesting kind of legal liability. For once, silly jury verdicts have had a beneficial chilling effect. HT on Item 4 to Greg Dwyer. The average tax wedge in New Zealand is much lower the OECD average and also below that in Oz. A single person on the average wage has a 16.4% tax burden in NZ; the burden in Oz is 27.2%. A single parent with two kids on 67% of the average wage has a -18.4% tax burden as Working for Families (our EITC, targeted at low to middle income workers with children) makes the average labour tax burden strongly negative: the worker takes home rather more than his or her employer pays out, though he'll then go on to pay 15% GST on all purchases. Notably, it looked like heavy drinkers' consumption was more affected than that of moderate drinkers: I strongly expect that the penalties for public drunkenness, penalties for being drunk on the job, and compulsory treatment were here doing the bulk of the work, though the authors correctly note that their data doesn't really let them tell which elements of the campaign were most effective. If EQC can mistakenly send out a spreadsheet containing most of the relevant details on most of the Christchurch earthquake claims, why are they unable to provide those same details to homeowners who request them? News reports yesterday said that the EQC data breach included only addresses and claim numbers. I had a hard time thinking of potential exploits using that data until I started thinking of the homeowner as the mark instead of EQC. But non-instrumental privacy concerns seemed pretty trivial. Today we learned a bit more. The row first erupted on Friday after an EQC senior staffer sent an email with the Excel data attachment to Christchurch businessman and persistent EQC critic Bryan Staples. He deleted the information and signed a statutory declaration that he did not copy it. Staples, who owns Earthquake Service Ltd, went public yesterday saying he wanted EQC to disclose the information to the individual householders. "This is stuff everyone has a right to know," he said. Staples said he was not the only person to see the email which listed the household's claim number, asbestos rating, EQC tolerance approval, which aspects of the claim were on hold, land information, whether the address was awaiting assessments, engineer's report, the EQC supervisor, the contractor's name and quote, and EQC's value of damage estimate. Staples also said he looked up the information for one of his clients on the list for whom his company had done repair work, costing $55,000. EQC had said $55,000 was too much and had cash settled for $30,000 with the homeowner. But the spreadsheet showed EQC has allocated $59,000 for repairs. Now that's a bit different from addresses and claim numbers. If this were released for our house, I still would have only instrumental privacy concerns rather than intrinsic ones: I'd worry that somebody might start sending in fraudulent claims on our number and try redirecting payment to their own account, but it wouldn't bother me otherwise. We're opt-out, so we're not in the .xls file. Frustrated Cantabrians hunting for information on their broken homes have swamped EQC with thousands of Official Information Act requests, pushing the 20-day response deadline out to an unprecedented five months. Christchurch homeowners say waiting almost half a year for crucial information on their properties is "inexcusable" and the chief ombudsman says the current waiting list is "not satisfactory". [Andrea Laws] filed her first request in early August 2012 and said she received only part of the information in mid-September. EQC refused to send Laws any more information for months until she complained to the ombudsman, she said. "They really didn't want to do the OIA. I had to ask them two or three times where my response was and when it came through there was email correspondence that said: ‘Do not provide the claimant with information or time frames'," she said. This is unlawful and it is unacceptable. On the first front, the OIA requires a response " as soon as reasonably practicable, and in any case not later than 20 working days" after the request is received. While the twenty-day limit can be extended, that cna only happen if it is for or requires searching a large volume of information, or if required by consultations with other agencies. Being flooded with requests and just not feeling like doing them is not an excuse. Any agency faced with such a situation should be hiring extra staff to cope, not ignoring requests. It looks like answering at least some of these OIA requests would just require 5 minutes in an .xls file. Say five minutes to extract the data, five minutes to clip it into a reply email: one EQC agent could be answering 400 of these a day. There are potentially innocuous explanations for the discrepancy between the cash settlement Bryan Staples cites and EQC's cost estimate: it's not implausible that EQC budgets include padding in case the repairs are more substantial than expected, and that the cash settlement did reflect the real damage. Or it could be that they're just screwing down costs. Here's an interview with Bryan Staples. What the heck is EQC doing if it can't get basic information out to homeowners, but has it all sitting in a darned Excel file? At our little opt-out, EQC continues trying to screw down cost estimates provided by our builder. Hopefully they'll soon come to some agreement. Update: Here's Chris Hutching at The NBR (gated) making a similar point. As a government department, EQC simply is not accountable in the way a private company would be. I agree. But the private insurers have hardly been providing stellar customer service either. * You can get around this, for now, if you're an honest seller, by keeping all the files and making them available to potential buyers. But in 10 years time, there are going to be a lot of people on-selling earthquake-damaged homes that they purchased after the quakes and who will claim that the earthquake paperwork was lost. Get it on the LIM. I appreciate privacy concerns, but I'm far more worried about whether any privacy breach can yield instrumental harms. * And here, I'm having a hard time seeing it. Imagine that you had the spreadsheet listing the claim number and home address for each house in Christchurch, but nothing else. How could you profit from that knowledge? Send fake invoices to EQC for payment. Claim to have done work on particular addresses and cite the EQC claim number. But: you're probably going to have to give EQC a bank account for transfers. If the homeowner catches wind of it, the fraudster would likely be found out fairly quickly. So your best bet would be to drive around looking for houses where construction work was already underway and to invoice for those addresses, hoping that the receipt would be paid in the confusion and that you could just switch to a different fake company every week. I doubt this would work out, but there's random draw chance that EQC might pay out on any individual invoice. Enough of these and you might get a bit out of it. You could try calling into EQC to redirect payments that should have been going to the homeowner, but this is really unlikely to work. Whether the house is Fletcher's or opt-out - if it's Fletcher's, I think EQC pays them directly. If it's opt-out, you'd need to know enough about the repairs to tell them something about the outstanding invoices you want sent to your new bank account. I bet you could get a lot of this out of Facebook pages for anybody listing a real address in Facebook. You'd need to be able to get through to EQC on the phone (hard), or send them letters with your new account information. In the latter case, they might notice a pile of letters all asking that payment be sent to some particular account. If you're phoning, you can always hang up if things aren't working out, so they only get the account number for the small set that work. Bottom line: it's hard enough for legitimate claimants to get anything done through EQC; I doubt fraudsters could get much out of this kind of data breach. But maybe I underestimate their patience for sitting on hold, or their creativity. * People shout a lot about privacy, then happily hand over massive amounts of private information in exchange for lollypops. If you're complaining about EQC privacy violations on your Facebook page, and you're doing it because of privacy per-se rather than because of fraud exploits, you're exactly the kind of person I'm talking about. Update 1: Chatting with Paul Walker on the way out the door yesterday, I realized that the best mark is the homeowner rather than EQC. He suggested calling the homeowner to pry out more details that you could use with EQC. I then reckoned it made more sense to call the homeowners pretending to be EQC and saying the only thing left before final claim resolution was for them to wire over the deductible on their insurance claim so that EQC could pay the whole thing to Fletcher's at one go. In the wrong hands, this could be rather damaging. Auckland's Professor Tim Hazledine says New Zealand's real problem is low income, not the cost of living. While I agree that, longer term, we do have a productivity/income problem, we perhaps have different takes on solutions. First, imagine that labour productivity doubled and that wages doubled. Some cost-of-living elements would ease substantially - food and tradeable goods in particular would become much cheaper relative to income. But what would happen to the cost of housing in Auckland or Christchurch? If housing supply is inelastic, then its price goes up with demand. Double incomes, and some of it will turn into improved housing quality via home improvements. But much of it will just bid up the cost of housing. How much of the wage increase would be eaten up in housing cost increases would depend on the income and price elasticities of housing demand and the price elasticity of housing supply - in other words, I don't know. But I don't think it's nuts to think you could eat up a reasonable part of any income increase with housing price increases given tight supply conditions. "I don't think it's a crisis and I don't think it's something we can do a lot about," he said. "The main problem is on the income side and how much money we've got to spend." He said the key to making things more affordable is to raise incomes and, in particular, to raise the minimum wage. Hazledine says New Zealand is not a particularly productive country in economic terms. "We don't have such high wages as Australians in particular do. This is why many New Zealanders move over there." Incomes in New Zealand have kept in pace with inflation but have not got ahead of it. Hazledine believes this is part of the issue. "We haven't really grown over the last 20 years and that's the problem." If we have a low productivity problem, raising the minimum wage is not a particularly good idea. The minimum wage is $13 was $13.50 in 2012. The median hourly wages in the 2012 Income Survey was $20.86, so the minimum wage is 62 65% of the median wage. That's already really high by international standards; disemployment risks are pretty substantial. Stories getting to higher productivity from higher minimum wages tend to either be trivial (all the low productivity people are fired, so all we have left are the higher productivity ones. So yay! Productivity is up! ), or, to me, implausible (some kind of efficiency wage story where no employer figures it out on his own; monopsonistic employers having aggregate effects on skill acquisition). If productivity is the problem, I'm really pretty sure higher minimum wages aren't the answer. And Tim forgets to mention that the Australian minimum wage for 16 year olds is half of the adult minimum wage, and that their minimum wages vary by industry. I agree with Tim that the price of lots of things here seems very high. But I'm not sure that lack of competition is the most plausible answer. I can have books delivered to me from Book Depository in the UK for about 60% of the going NZ price; it's far more plausible that thin market problems and fixed costs in New Zealand are what inflate NZ book prices rather than lack of competition in the market for books. But lack of competition is a more plausible explanation in other cases. RMA complaints kept IKEA from opening in Auckland and Wellington; furniture here consequently remains rather expensive and nobody will sell me horse-meat meatballs in lingenberry sauce. Westfield v North Shore City Council also showed how the RMA could be used to block competitors' entry. On the whole, New Zealand runs a pretty decent set of policies for encouraging real competition: very low tariff rates while allowing parallel importation. Both wages and real household income are up substantially on 1998. * The blue line below tracks median hourly real wages in 2012 dollars; they're up 14.6% from 1998 to 2012. ** Hourly wages have continued upwards fairly nicely. Median real household income, the red line, is up 24.9% over the entire period but dropped with the recession and hasn't really come back. *** I'd expect that digging further into the tables would show some of that being due to labour force exit. I worry that if the agglomeration folks are right, distance and scale will keep hurting New Zealand's relative position. Hiking the minimum wage really isn't much of a solution to this kind of problem. Instead we need to fix land use policy so we can increase population without killing housing costs and keep working to make New Zealand an attractive place for international migrants. * Alas, NZDotStat only has Income Survey data back to 1998. ** Recall that the GST increased from 12.5% to 15% while income tax rates dropped to offset the increase in the GST. If you're using before-tax incomes, you have to use a GST-adjusted CPI. *** Note that I've just used Google's default scaling for the graphs; using a zero bottom end would artificially suppress variance. iPredict was a bit overloaded during the surprise Labor leadership vote yesterday - it probably saved me from losing money. But it's fun to see what the markets thought of the whole mess. Labor's odds have been in the toilet for, well, ages. At iPredict, contracts paying $1 if Labor were to win were trading in the $0.15 - $0.22 range; for the couple days prior, they sat at 15%. Gillard's odds of surviving to be Labor leader on nomination declaration day were around 70% prior to the vote's being called - they'd eroded by about ten points over the prior fortnight. When the markets saw there was to be a leadership vote, Labor's odds jumped as high as 30% while Gillard's odds of surviving to nomination day dropped below 10%. 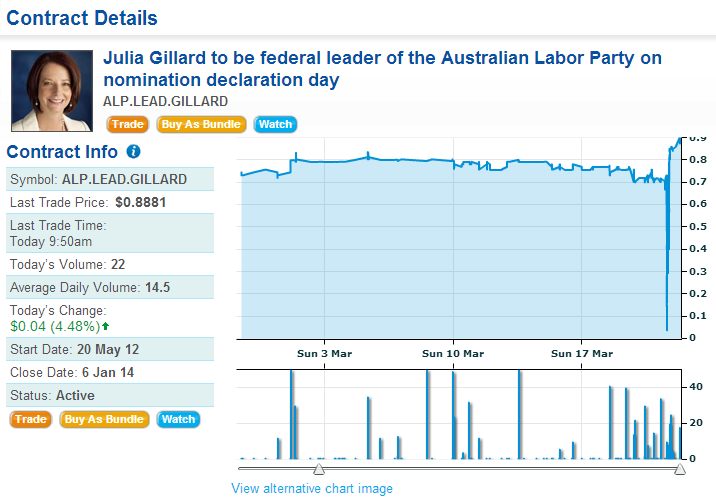 Labor's odds stabilised around $0.17 afterwards, with Gillard now 88% likely to lead Labor into the next election. 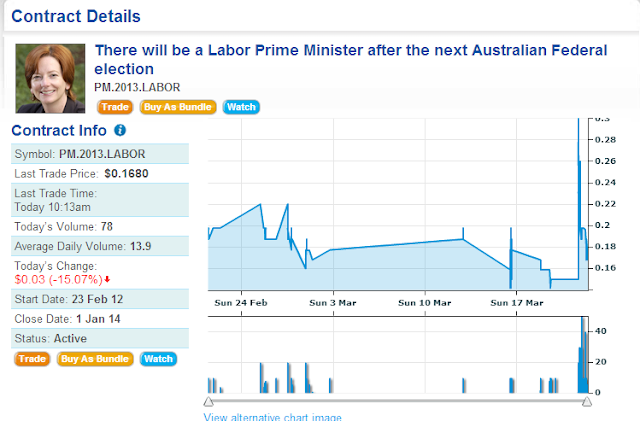 When the markets thought Rudd would be coming back, Labor's odds of winning went up. 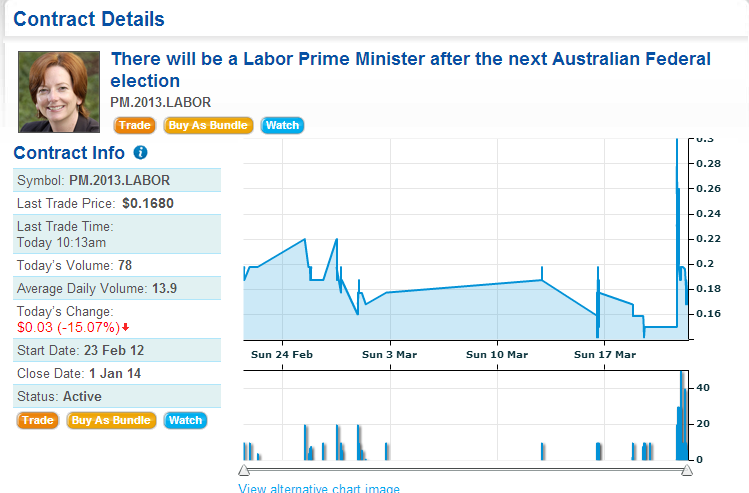 After #spill failed, Labour's odds went back down. I wouldn't necessarily interpret this as the markets saying that Gillard should have been turfed; you might want to keep a less popular leader through an election you're likely to lose to keep your options more open after the election. Me? I'm hoping that, after a year of a very large majority Coalition government, Andrew Leigh becomes Labor leader. He then loses the next election but not by a lot. Instead, he gets a lot of new Labor talent in who gain experience. Then he wins the subsequent election. I don't think I'd pay more than $0.05 for that contract, but I can hope. Matt Nolan provides the best critique of the whole thing. In short, he doesn't think the government can credibly commit to letting depositors take the haircut. Taxpayers will be on the hook if something bad happens, there's nothing we can do about it, and we might as well force banks to pay for insurance now because they'll get bailed out later regardless. I think he's got the best argument against OBR, but I put a bit better than even odds that he's wrong. Why? Bailout pressure is endogenous to the risk imposed on depositors. And a bank would have to be in pretty rough shape to wind up imposing any substantial haircut on depositors after having burned the unsecured creditors and the equity. Now the unsecured creditors and equity holders could work pretty hard to convince the depositors that the haircut would wind up being really big so that they could pressure the government for a bailout that would also protect the big guys. But the first-stage deposit freeze would be an upper bound on depositor losses and anchor expectations. Further, consider the government's approach to bailouts consequent to the Canterbury earthquake. The government refrained from bailing out anybody who hadn't purchased insurance and even, arguably, imposed a massive taking on red zone owners of bare uninsured land - despite plenty of very real very sad stories in the Press about the consequences. RBNZ cannot bind future governments. But setting up the regime well in advance of a bank failure specifying that, no matter what else happens, the equity and (subordinated) bond holders get burned first gives those agents reasonable expectation that they should try to make sure that doesn't happen. If some future government defects by bailing out depositors, I'd expect it to happen only after burning through the equity and bondholders. It's worth re-reading Rod Carr's speech on the topic from 2001. Open-Banking Resolution seems consistent with the goals he there outlined. * I hate "unfrozen". But "thawed" just doesn't seem right. Again, I'm not a banking reg guy. ** Secured creditors seem ahead of depositors in priority of claim; I'm sure that there's some really good reason for this, but I'm not a banking-finance guy. I'd have thought depositors' claims should have been ahead of all others, so there must be a good reason that they're not. Presumably this is a margin on which banks could compete, if depositors cared about it: lower interest rate payments in exchange for being less likely to take a haircut if bad stuff happens. It would have made more sense to me that there be some mechanism for converting secured creditors' assets to an equity interest for recapitalising the bank. Again, though, totally not a banking reg guy. I'm actually pro-bailout, I just want the bank's executives and board members shot in the face as part of the process. Matt Yglesias, author of "The Rent is Too Damned High", points to work damning America's blue states. The map shows that it takes far more hours of work at the state minimum wage to afford a two bedroom apartment in California, Maryland, DC, New Jersey, New York and the like as compared to North Dakota, Montana, and Oklahoma. While the minimum wage is higher in the blue states, land-use restrictions keep housing pretty expensive. Now there are some potential problems in the measure. They set an affordability line at 30% of income assuming a single earner household, but they don't seem to have accounted for the raft of other benefits that those low-income workers receive, most notably via EITC. So when they say that it would take a wage of $27.15 per hour to be able to afford a two-bedroom apartment in DC, that's just the number you get when you take the HUD Fair Market Rent measure, divide it by 0.3 to get the monthly wage necessary to afford that rent, then turn that into an hourly wage rate. Add in a second earner and the household wage of $27/hour is much easier to achieve. And EITC tops up wages at the lower end of the distribution, especially for those with kids. Maybe the median price isn't a good indicator. Let's take the median overall price as the maximum in our search and get the 25th percentile. The median 2-bedroom property in the "under $400" set is $350: $29 per hour. Maybe that's too nice a place too. The median price on the first page of the low-to-high price-sorted search is $260: $21.67 per hour. On a 40-hour week at minimum wage, you'd be paying half your income in rent to afford it. I'm not arguing we should set policy so that a single earner on the minimum wage can get a two-bedroom apartment on 30% of his salary. But that we fare poorly on a "number of minimum-wage hours necessary to rent a two-bedroom apartment" measure against the US, when the minimum wage here is much higher as a fraction of median the median wage than it is in the States, does suggest something about NZ land use policy. Just keep holding that pause button, guys. It'll all be fine. Just like in SimCity. Christchurch is pretty short on hotel accommodation. A hotel wants to rebuild. The insurance is all sorted out. But, the government will not tell them whether the government will go ahead with its plan for an arts precinct, in which case their land could be taken from them by the government under compulsory acquisition, or whether they can start rebuilding their hotel on their own property without fear of expropriation. While the hotel chain hasn't yet demolished the old building, it takes a while to plan for a site and to get the appropriate consents even without the zoning uncertainty. CCDU project delivery general manager Greg Wilson said the Copthorne hotel was situated in the area designated for the performing arts precinct, which was a work in progress. The final makeup of the precinct would be linked to decisions made on the future of the Town Hall, he said. For anything else to be built on the Copthorne Hotel site, written consent under the Resource Management Act was required from Earthquake Recovery Minister Gerry Brownlee, Wilson said. "The test is whether the proposed use would prevent or hinder the public work - in this case the development of the performing arts precinct." No hurry. Pause buttons are great. It's only been 757 days since the February 2011 quake. Hopefully, delays mean good things in this case: Ng Gallery might survive the planned stadium and will not be put under compulsory acquisition. Insurance delays and uncertainty continue. Campbell Live covered things well last night. The Insurance Council's Tim Grafton correctly notes that there are some complicated cases where it took a while to sort out whether you could rebuild on a property. Then there are the messes between the insurers and the reinsurers, between the insurers/reinsurers and EQC, and between the whole lot of them and the change in building code that ramped up repair costs. But there are other cases where no such uncertainty exists and where there hasn't really been much progress. And the length of time to resolve scraps between insurers, reinsurers, and EQC is endogenous to the legal regime. While marketing is turning into a data-driven science blending econometrics and psychology, New Zealand's marketing majors are not particularly quantitative. So Gameloft has more particular requirements. Here's Cab Calloway on backward-bending labour supply curves, the deadweight costs of income taxes, and how there's less inequality in utility as measured by consumption-based measures than when measured by income-based measures. Wearin' one pair of shoes, you know, ain't no crime. What d'ya wanna do, Bub? Be big like Gugenheim? A hotdog only costs that cat a dime. but you see the latest movies just the same as he. They both listen to the radio an' all for free. I'm askin' you, Bub, how big can you be? This post brought to you* by Spotify which, for $10 per month, or 46 minutes' work at the New Zealand minimum wage, brings you darn near the world's entire back catalogue of music. An' all for free, if you don't mind the occasional ad. Joanna Mathers reports in the New Zealand Herald that beer consumption has more than halved since 1973: from 181 litres per adult to 79 last year; she says total beer consumption is the lowest it's been since the Second World War. Alas, I'm not able to find Stats NZ data giving total alcohol consumption per capita going back that far - the series giving pure-alcohol equivalents goes back to 1986. But I've been able to find a now-discontinued series giving volume of beer, wine and spirits available for consumption, per head, from 1935 to 1981. The series is ALC006AA, if you're searching. It's a bit tough to get a per capita alcohol consumption measure out of this. First, I have no clue what the denominator is in "per head". If it's per person over the age of 20, because that was the alcohol purchase age, then the figures count towards adult consumption all underaged consumption and consequently overstates adult consumption. If it's per capita, then it allocates some adult consumption to infants and understates adult consumption. Further, I don't know the average alcohol content of the beer and wine consumed. We can make some assumptions there though. I'll assume that beer is 5% alcohol by volume, that wine is 14% alcohol by volume. The series notes tell us that spirits are measured in proof litres, so that helps. Under those assumptions, this is what we get. I'm not sure I believe the numbers pre-1950. But, what crisis New Zealand had with alcohol consumption seems to have taken place in the 1980s through about 1992. From 2000 onward, we're where we were in the mid-to-late 1970s. I'm not sure how far back in time the crisis-shouters want to push us. Note that income matters a lot too: we're richer than we used to be, so we can afford more cars, bigger houses, and more and better booze. I expect that some of the leveling-off in total consumption coincides with the rise of craft brewing and shifts towards drinking less but better beer. Stillman's difference-in-difference numbers have the same result. My talk at Canterbury covering this and more. I'm glad that the Herald is reporting on the drop in beer consumption. Putting it in the context of recently flat aggregate alcohol consumption would have made it clearer that the drop is partially due to aggregate consumption drops since the early 80s, and partially due to category shifts to other beverages. * The alcohol per capita series ALC005AA only starts in 1986. ** Go and play in Infoshare [get "Industry Sectors", then ALC] and compare the 18+ and 20+ series; they're not far off from each other. In an earlier post, I used 15+ because that's the measure used in some international comparisons and I was noting international comparisons. It would be too quick to say that Coasean stories fall apart when these kinds of cases exist; they could be the sad occasional ex post enforcement that keeps all kinds of other bargains from falling apart. But they do make for interesting cases. But they do make for interesting cases. Via +Courtney Knapp: Spite Houses. Houses built to spite the neighbours. Mental Floss lists nine of them; the article seems mostly repetition of the Wikipedia page on Spite Houses. Some of the houses seem more example of bloodymindedness than of spite. But the comments thread at Mental Floss provides all kinds of other interesting cases. Outside of Somerset, Manitoba, near where I grew up, a farmer who had some grudge against a neighbour built a pig barn directly opposite the neighbour's house, his own farmyard being a couple miles down the road. I don't know if it was a fight over churches or local schools, but the targeted family seemed exceptionally unlikely ever to have done anything to anyone that might have warranted such treatment. Spite isn't an edifying motive, but it can be a motive nonetheless. The more that you think others are motivated by spite, and the less responsive you think spite is to side-payments, the more you want restrictive zoning rules like set-backs. And we're the irrational ones? If just about any deviation from blackboard rationality is enough to declare market failure and say we need be subject to state control by rational bureaucrats, what are we to make of this? One bunch of state bureaucrats tries to ban or limit sugar intake. Another bunch of state bureaucrats advance loans to sugar processors and then have to buy a pile of US sugar to prop up prices to avoid those processors' defaulting on the loans. I suppose you could view the "pushing prices up" part as consistent with limiting consumption. But the initial loans wouldn't have been. And what are they going to do with the 400,000 tons of sugar they're planning on buying? More ethanol? And doesn't the state try to stop people smoking while subsidising tobacco growers? It's not unreasonable to view individual decision-making as being the outcome of warring homunculi within the brain. It's never been clear to me why even a rational unitary state might think itself in a position to overturn the outcome of that conflict, never mind a state that has battling-homunculi issues of its own. Ah, campaign finance. There's always a workaround. Suppose you're worried about undue corporate influence on politics because of corporate donations. So you ban it. Here's the Winnipeg Free Press on a lovely Quebec case study. A vice-president at SNC-Lavalin (TSE:SNC) admitted to participating in such financing activities while testifying Thursday at Quebec's corruption inquiry. Yves Cadotte said dozens of SNC executives, and sometimes even their spouses, donated just over $1 million to the Quebec Liberal party and the Parti Quebecois between 1998 and 2010. A small majority of that cash went to the Liberals, although the PQ got nearly 50 per cent of the amount. He said executives would get company bonuses after they donated, with the amount of the bonus greater than the donation amount. ...the law was tightened in 2010 to crack down on companies that reimbursed people for making endorsements. SNC-Lavalin notes that their practice was entirely in keeping with the letter of the law prior to 2010. And I would be surprised if there weren't other workarounds for the post-2010 period. In a tense exchange, Cadotte was told by a commission lawyer he was breaking election laws and was asked whether he was aware it was illegal for companies to donate. But he said it was the political parties that came to solicit the money. He said the parties would even set fundraising targets for his company. SNC-Lavalin received 550 contracts, worth $247.5 million, from Quebec's Transport Department between 1997-98 and 2011-12. Cadotte said he didn't believe the donations helped get public contracts. On the other hand, he said the company was afraid of what would happen if it didn't donate. "That's the dilemma: not contributing would be a risk that is perhaps intangible," he said. "Maybe there is no (consequence), but in our mind it's a risk we don't necessarily want to take." Why is it legal for political parties to have fundraising targets from corporates that are forbidden from making donations? Hire a Party official as consultant on inflated salary; the official or the official's spouse donates to the Party. Rent property owned by the Party at inflated prices. Subscribe to a Party newsletter at a high subscription fee. Host Party events on corporate property for low/no rent. Pay very high speakers' fees to have party officials give breakfast or luncheon addresses for your staff. Have staffers work the parties' election campaigns as volunteers while still on the corporate payroll. Or at least those are a few things that occurred to me within half a minute. Surely sharper folks than me with more at stake could come up with better ones. Conspiracies and power struggles everywhere. Here's Auckland's Boyd Swinburn on the New York soda ban being overturned. Boyd Swinburn, the University of Auckland's professor of population nutrition and global health, said the court battle's significance was in the power play it represented between government and industry, "the power politics between public health versus private profit". "It does show the enormous power of the food industry. It seems to be marching from victory to victory around the world, including New Zealand." Justice Tingling, if I read the ruling correctly, basically said that the Health Board hasn't the legislative authority to regulate this kind of thing unless New York City Council enacts legislation allowing it. I'm no lawyer, but I've no reason to expect Tingling has this wrong. I'd also expect that if Bloomberg really wanted the ban and thought he had the votes on Council to do it, he'd be trying to get the ban through Council rather than talking about judicial appeals. If he hasn't the votes to get it through City Council, maybe it's because Swinburn's "power of the food industry" hypothesis, or maybe it's because a bunch of people in Brooklyn are fed up with this kind of nonsense and would punish their Councillors for it. I've not been following the poling on this closely; a quick Googling suggests that it's hardly a policy drawing unanimous appeal and that would have passed but for Big Sugar. Instead, there's a slim majority in opposition to the policy. But Swinburn's all about the framing here: "public health versus private profit". Voter preferences don't enter into the story because they're all on his side, never mind the polling. Expect this framing to be used here when Swinburn's type push for similar policies here. The latest Stockwell piece on alcohol minimum pricing and alcohol-related fatalities seemed a bit fishy. I was mostly worried about how they ran a panel study that had zero cross-sectional variation in their main regressor of interest and where the main source of time series variation was CPI adjustments to measured prices, but it looked like there were plenty of other holes for truck-driving expeditions. What’s troubling here is that they break the data down into many quarters and categories, run multiple statistical tests, but don’t adjust for multiple testing. This results in a table spotted with statistically significant results even as basic statistics tells us this method will produce spurious results. A close look at the table is suggestive that spurious results are indeed at hand. This table looks at 16 quarters following a minimal price increase, and whether there is a correlated increase or decrease in deaths among acute, chronic or wholly attributable alcohol deaths. The authors point to a statistically significant decrease in wholly attributable deaths in the quarter that a price increase was implemented, as well as in the second and third subsequent quarters. (but not in the first quarter, nor the 4th-15th quarters). But it also shows a significant increase in acute deaths in the third and fifth quarters after a price increase, and then a statistically significant decrease in acute deaths in the 8th quarter after the price increase. Chronic deaths saw statistically significant decreases in the 8th, 9th and 13th quarter after a price increase, but not in the other 13 quarters. This all suggests that the results could be, at least in part, the result of simply running a lot of tests on a lot of data – and without adjusting for multiple tests, randomness can creep in. Though the results do lean toward decreased death, picking out the most extreme of the results (as the media and the authors of this study did) may be misleading. In fact, if the 1,388 wholly alcohol attributable deaths occurred evenly over the quarters, these numbers refer to trends in about 87 deaths each quarter – trends that would be highly sensitive to a small number of deaths. So while there seems to be an overall trend of decreased death with increased prices, the failure to account for multiple testing means there could be true correlation or there could be just a statistical fluke. Eventually, somebody's going to take a proper shotgun to the stuff Stockwell's been up to. When Chris Auld was doing their econometrics, I didn't worry about their empirical results. Things seem to have gone a bit adrift since then. Google Reader is part of my external brain. Anything I want to be able to find sometime later, I star. Searching my starred items almost always brings up whatever it was I needed. When I find useful stuff on economics blogs for my courses, I tag them with the appropriate course code; when updating the syllabus and notes before the start of semester, I flip through all the tagged items and make the appropriate adjustments. As SimCity seems a training ground for future urban planners, here are a few features I'd love to see incorporated in the new edition. Real-time play with an unstoppable clock. You could wind it down to be as slow as the real world, but never pause it. Dithering over zoning decisions interferes with the simulated individuals' plans and has them leave in frustration. The clock should keep running, at real-world-time, even during saved games. Bulldozing houses without above-market-value compensation makes residents unhappy. You should have to weigh these costs against whatever it is you're trying to bulldoze into existence. Inertia costs: building up a tighter regulatory structure and more prescriptive zoning rules causes delayed implementation of future changes. So if an earthquake hits and you were running a tight smart growth policy ex-ante, it takes you longer to change any of your zoning. If you've only been running the policy for a couple of years, maybe you get a month's delay. If you've been running it long enough that that's the only thing your bureaucrats know, change is almost impossible unless you fire them all. The new edition embeds intercity effects, at least according to the reviews. I'm really curious to see how they handle investment and mobility flows. Are simulated residents homogeneous in amenity preferences? How does Tiebout work in this world? I really hope that the new edition doesn't assume that stadiums could never exist but for local government financing. The reviews of the new SimCity look great. Once they've added enough servers or added an offline mode to make the thing playable, or maybe once a cracked version without the mandatory-online-DRM-downgrade is widely available, I'll likely give it a shot. I hope at least a couple of these are in there. New Zealand has one of the world's cleanest tax codes. It typically aims to avoid distortionary effects and to avoid collecting tax where the collection costs outweigh the taxes that would be collected. So we have GST on imported goods, but only where the total value of the import is high enough to make it worth IRD's time. And, we have a Fringe Benefits Tax to avoid giving employers undue incentive to provide in-kind benefits. NZIER has criticised IRD's latest proposed extension of the FBT to employer-provided parking. The extension, as I read it, seems consistent with IRD's general philosophy: don't bother collecting a tax where the value at stake is small; apply FBT where a valuable consideration is provided to the employee in lieu of salary. So they will charge FBT on employer-provided parking downtown, where parking is expensive, but not out in the burbs, where it's cheap. The value of employer-provided parking has risen along with downtown land prices. But administrative costs here are going to be pretty high, and the new system will likely wind up distorting location choices near the tax/no-tax FBT parking zone boundaries. Whether the distortions caused by the tax will wind up being bigger than the distortions caused by failing to implement it isn't clear to me. But I do like Bill Kaye-Blake's demand that IRD be consistent and tax all the things. Some employees might negotiate a parking spot instead of a raise, but what about a bigger office? Nicer coffee? A bigger desk? Plusher carpets? More attractive assistants? I like where Bill's going with this, but he clearly hasn't gone far enough. What happens if, after you've negotiated your job and salary, the employer chisels on the non-pecuniary side by sticking you in an open plan shed for a few years before moving you into a much-smaller-than-expected office in another building? Or if the work conditions deteriorate substantially? Shouldn't the employer get a FBT credit for those kinds of things that they might then provide compensation to the employees and prevent their departure? Now, think about disamenities. Suppose there's some disamenity that would cost the employer $1.20 to avoid (say, installing a better air conditioning system) but that the bearing the disamenity only costs the employee $0.95: he would prefer the bundle of the disamenity and a $1 cash transfer. The best solution has no abatement and a higher salary. But, it costs the employer $1.33 $1.50 to provide the $1 cash transfer and so the employer inefficiently abates the disamenity because of the lack of FBT tax credits. Some might think it perverse that an employer be awarded a tax credit for providing disamenities. But efficiency may well require it. If, that is, the administrative overhead isn't itself more distortionary. ** $1.50 - 0.33*$1.50 = $1 ==> I made stupid math fails when the actual numbers don't really matter in a constructed example. Radio New Zealand reports international student visa numbers are down; they blame the high dollar. The real cost of tertiary education in New Zealand can vary substantially with exchange rates. There isn't much that any University can do about levels, but we could perhaps be doing more to reduce uncertainty. Who is better placed to mitigate the risk of currency fluctuations: a family sending their kid abroad for study, or large enterprises with budgets in the hundreds of millions and with finance departments? Exchange rate insurance: the University sells to incoming students contracts that give them a cash bonus if their home currency drops by a set amount. Tuition is maybe a third to a half of an international student's total cost of study. If the home currency tanks or the NZD jumps, living here gets a whole lot more expensive. Universities can use the up-front fees to buy option contracts on foreign currency that would let them pay out the students in case of dramatic currency fluctuation. Again, so long as large institutions have cheaper access to these kinds of contracts, this should work. I work in what is perhaps the most competitive and successful sector in the most competitive and successful economy of all time. If somebody can tell me what I'm missing, I'd appreciate it. Another option that could help, and as suggested previously, the government could guarantee that international students completing a degree at one of our better tertiary institutions would be given permanent residence on degree completion, subject to the usual criminal background and health checks. The path from student visa to work visa and residence is pretty easy, but it adds uncertainty for students who don't know that it's likely to work out. Making the default be permanent residence on completion unless you screw something up badly, rather than having to go back home unless you get everything right, could make the degree more attractive even when the dollar is higher for a longer period. Added benefit: foreign students currently cross-subsidise domestic students. Increasing the ratio of foreign to domestic students would effectively increase tertiary funding without it having to hit the government's books. @ericcrampton Management costs per student? Risk of screwing uphedging (e.g. ft.com/cms/s/0/adc3b9…)? Ratio private/gov funded students? Management costs per student shouldn't be that high - when the student purchases the contract, you buy the option contracts, then forget about it until you need to execute. Risks of screwing it up are large though if universities are incompetent at this kind of thing. The link Luis provides points to the temptation to overmanage and earn on the hedge rather than just keep it as insurance. I doubt that any university's portfolio of international students includes enough home-government funded students to make the packages not worth offering, but it could be true in some places. Unless you've run the regressions yourself, it's often hard to trust empirical results. A lot of results are fragile - small changes in specifications, either changing date ranges or adding seemingly irrelevant variables, can change results. And endogeneity always makes inference hard in social sciences. First best is running things yourself. If the data and code are available for replication and extension, then it's impossible to maintain outright fraud. And fragile results will eventually be commonly known to be fragile. Boing Boing recently ran a very nice summary in two parts on why we see so many contradictory results on guns and crime: all the specifications are fragile. On some questions, teh science isn't strong enough to give much policy direction. When the data is not publicly available, we really have to trust the people running the specifications. There can be good reasons for keeping data private. Most self-interestedly, if the researchers did a ton of work in putting together the dataset, they might well want to get a few papers based on it before letting everyone else pile on. It's not an edifying reason, but even if the data collection involves public funding, it doesn't seem unreasonable to give the survey team the first few kicks at the can. On the other hand, if the data cannot be shared without violating the privacy of individuals who answered the surveys, and if there aren't clever ways of anonymising the data so that it cannot be used to identify individuals, then that's a pretty good reason to be stingy with the data. But, there potentially being good reasons for secret data certainly isn't sufficient reason to trust the consequent analysis. And so we come to Dunedin vs Rogeberg. I'll be interested in seeing the Dunedin group's reply when it comes out. Rogeberg points to evidence the Dunedin group themselves have provided showing reasonable cohort differences between users and non-users. It's not implausible that these kinds of differences are responsible for at least some of their measured marijuana effect. It would be simplest if Dunedin would send Rogeberg the data and make him sign a data confidentiality waiver; it's not particularly plausible that a Norwegian labour econometrician wants the data for identifying NZ individuals. But if they're not willing to do that, they should at least be willing to put his code to their data. I'll be downgrading my trust in all the Dunedin Longitudinal results if they don't handle this well; secret data requires trust. The General Social Survey in the US would have almost as many privacy concerns as the Dunedin survey. And yet they're able to make available an online resource letting anybody with a web browser run analysis on the data, for free. I regularly set assignments in my undergrad public choice class where students without much in way of metrics background have to go and muck about in the data. As I understand things, the Health Research Council funds the Dunedin surveys. There's a worldwide movement toward open data in government-funded projects. HRC could fund a Dunedin Longitudinal equivalent of the GSS browser analytics. Anything personally identifying, like census meshblock, could be culled. Nobody would see the individual observations. And any cross-tab that would reduce to too-small a number of observations could return nulls. But folks with concerns about Dunedin studies could do first-cut checks without having access to the bits that might cause legitimate worries about privacy. Somebody like Rogeberg should be able to run a t-test on whether those who later go on to report marijuana use differed on other important variables prior to their starting consumption. We all could trust Dunedin results more if we could check things like this. And it shouldn't be hard to set this up either: see how SDA coded things for GSS, put in the Dunedin data instead, then host it. If HRC did this, one small bit of funding could have a whole ton of researchers publishing useful studies based on the already-funded survey instead of having to fund Dunedin for every new regression. Let the Dunedin group keep any new wave of the survey under wraps for a couple of years before releasing it to the online analytics so they get a fair kick at the can. After that, why not open things up? CPP to bet on NZ dairy?